قربانی, هادی, گلزار, محمد, بهروش, امیرحسین. (1395). مدلسازی آغشتگی در فرآیند پالتروژن کامپوزیتهای گرمانرم. 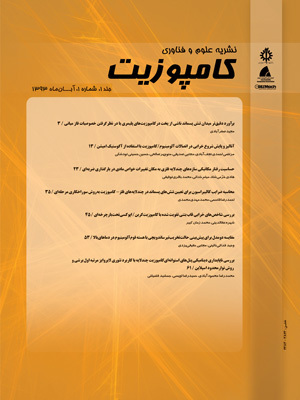 علوم و فناوری کامپوزیت, 3(1), 31-42. هادی قربانی; محمد گلزار; امیرحسین بهروش. "مدلسازی آغشتگی در فرآیند پالتروژن کامپوزیتهای گرمانرم". علوم و فناوری کامپوزیت, 3, 1, 1395, 31-42. قربانی, هادی, گلزار, محمد, بهروش, امیرحسین. (1395). 'مدلسازی آغشتگی در فرآیند پالتروژن کامپوزیتهای گرمانرم', علوم و فناوری کامپوزیت, 3(1), pp. 31-42. قربانی, هادی, گلزار, محمد, بهروش, امیرحسین. مدلسازی آغشتگی در فرآیند پالتروژن کامپوزیتهای گرمانرم. علوم و فناوری کامپوزیت, 1395; 3(1): 31-42. چکیده پیش‌بینی آغشتگی مذاب و الیاف تقویت‌کننده یکی از چالش‌های پالتروژن کامپوزیت گرمانرم‌ها می‌باشد. در این مقاله، دو مدل آغشتگی در فرآیند پالتروژن کامپوزیت گرمانرم توصیف شده است. ابتدا یک مدل ساده بر پایه رابطه دارسی ارایه شده است. در این مدل ابتدا بدون در نظر گرفتن جریان میکروسکوپیک، سرعت جریان ماکروسکوپیک محاسبه شده و فشار مذاب گرمانرم در جهت محور قالب در هر موقعیت طولی قالب محاسبه می‌شود. سپس به‌کمک محاسبه فشار در جریان ماکروسکوپیک طولی و ارتباط رابطه دارسی در دو جهت شعاعی میکروسکوپیک و طولی ماکروسکوپیک، رابطه ساده‌ای برای به‌دست آوردن سرعت جریان میکروسکوپیک شعاعی و شعاع خشک توده الیاف ارایه شده است که تخمینی از درجه آغشتگی را نشان می‌دهد. در بخش دوم، یک مدل آغشتگی توسعه یافته ارایه شده است که جریان میکروسکوپیک و تغییرات شعاع توده الیاف در طول قالب در آن در نظر گرفته شده است. معادله‌های دارسی در دو جهت جریان میکروسکوپیک شعاعی و جریان ماکروسکوپیک طولی نوشته شده است. با ترکیب رابطه‌ها، معادله‌ی کاملی با در نظر گرفتن دو جریان میکروسکوپیک و ماکروسکوپیک ارایه شده است. این معادله، گرادیان فشار در راستای طولی و شعاعی را به شعاع توده الیاف و شعاع منطقه خشک توده الیاف و ثابت های دیگر ارتباط می‌دهد. یک الگوریتم حل تکرار شونده برای حل مدل توسعه یافته ارایه شده است و هر دو مدل با در نظر گرفتن ورودی‌های مدل حل و شعاع آغشته نشده در توده الیاف و درجه آغشتگی محاسبه شده است. The impregnation prediction of melted thermoplastic into reinforced fiber is the one of the challenges in pultrusion of thermoplastic composites. In this paper, tow impregnation models has been presented to analyze the impregnation in the pultrusion process of thermoplastic composites. At first, a simple model based on Darcy’s law is provided. In the first model, without considering microscopic impregnating flow, velocity of macroscopic flow and pressure of the molten thermoplastic calculated along the axis of the pultrusion mold. The calculated pressure in the macroscopic flow in the axial direction is combined with Darcy equations in microscopic and macroscopic flow, then the simple equation is obtained to calculate the radial velocity of melted thermoplastic and the radius dimension of the dry region of the fiber agglomeration. This dry region radius shows an estimate of the degree of impregnation. In the second part, a developed model has been proposed. In this model, microscopic flow and the radius changes of agglomeration are considered. Darcy equation is written in two radial microscopic and macroscopic axial direction flows. The perfect equation considering the macroscopic and microscopic flow is proposed. This equation represents the relationship between pressure drops in macroscopic axial and microscopic radial direction and the radius of the dry region and agglomeration radius with other constants. An iterative solution algorithm for solving the developed model is used. Both models for a series of inputs have been calculated. The degree of impregnation and radius of dried fiber region in agglomerations has been calculated. Sala, G. and Cutolo, D.,“The Pultrusion Of Powder-Impregnated Thermoplastic Composite,” Composites PartA, Vol. 28, pp. 637–646, 1997. Steggall-Murphy, C. Simacek, P. Advani, S.G. Yarlagadda, S. and Walsh, S., “A Model for Thermoplastic Melt Impregnation of Fiber Bundles During Consolidation of Powder-Impregnated Continuous Fiber Composites,” Composites Part A: Applied Science and Manufacturing, Vol. 41, No. 1, pp. 93–100, 2010. Tutunchi, M. Golzar, M. and Behravesh, A. H.,“Investigation of Thermoplastic Pultrusion for Tubular Product Production Using Prepregs,” Journal of Science and Technology of Composies, Vol. 2, No. 1, pp. 23–32, 2015. Kim, T. W. Jun, E. J. Um, M. K. and Lee, W. I., “Effect of Pressure on the Impregnation of Thermoplastic Resin into a Unidirectional Fiber Bundle,” Advances in Polymer Technology, Vol. 9, No. 4, pp. 275–279, 1989. Kim, D. H. Lee, W. Il. and Friedrich, K., “A Model for a Thermoplastic Pultrusion Process Using Commingled Yarns,” Composites Science and Technology, Vol. 61, No. 8, pp. 1065–1077, 2001. Bernet, N. Michaud, V. Bourban, P. E. and Manson, J. a. E., “An Impregnation Model for the Consolidation of Thermoplastic Composites Made from Commingled Yarns,” Journal of Composite Materials, Vol. 33, No. 8, pp. 751–772, 1999. Koubaa, S. Burtin, C. Le Corre, S. and Poitou, A., “Simple Modelling of Impregnation in Pultrusion Process of Thermoplastic Composites,” International journal of Microstructure and Materials Properties, Vol. 7, No. 5, pp. 428–438, 2012. Koubaa, S. Le Corre, S. and Burtin, C.,“Thermoplastic Pultrusion Process: Modeling and Optimal Conditions for Fibers Impregnation,” Journal of Reinforced Plastics and Composites, Vol. 32, No. 17, pp. 1285–1294, 2013. Ghorbani, H. Ataee, B. and Golzar, M., “Investigation of Impregnation in a Pultrusion die for Glass/Polypropylene Composite Wire,” in The 3rd International Conference on Composites: Characterization, Fabrication and Application (CCFA-3), pp. 129–130, 2012. Skartis, L. Kardos, J. and Khomami, B.,“Resin Flow Through Fiber Beds During Composite Manufacturing Process. Part I: Review of Newtonian Flow Through Fiber Beds,” Polymer engineer and science, pp. 32:221–30, 1992. Hepola, P. J. Advani, S. G. and Pipes, R. B.,“A Process Model to Descibe Matrix Flow and Heat Transfer in Thermoplastic Pultrusin,” in 49th Anuual Conference,Composites Institue,the Society of Plastics Industry, 1994. Astrom, B. T., “Development and Application of a Process Model for Thermoplastic Pultrusion,” Composites Manufacturing, Vol. 3, No. 3, pp. 189–197, 1992. Batch, G. L.,"Crosslinking Free Radical Kinetics and the Pultrusion Processing of Composites" PhD thesis, University of Minnesota,USA, 1989.